Welcome back. Last Friday, if perchance you missed it, I released a blog post, Roosters’ Crowing. 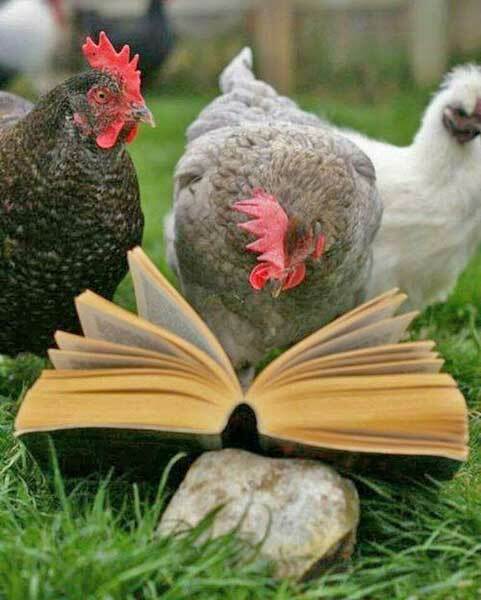 By an amazing coincidence, a few days earlier, a research paper was published on domestic chickens. You might expect a paper on chickens to address increasing production or pillow stuffing, but no; the paper, from The Someone Project, was a comprehensive review of the scientific literature on chicken cognition, emotions, personality and sociality. So here I am believing that chickens, the most abundant domestic animal in the world, are waaay down on the animal intelligence scale. The paper left me astounded. The researcher concluded that, in many areas, chickens rank up there with mammals and, certainly, most other birds. I just had to use today’s blog post to highlight a handful of for instances. When hens are placed together for the first time, they set up a dominance hierarchy, a pecking order. Although that begins with dominant hens overpowering subordinate hens, it proceeds through deductive reasoning: If Hen A is tougher than Hen B and Hen B is tougher than Hen C, then Hen C knows not to mess with Hen A. Further demonstrating cognitive capabilities and complexity, chickens make use of at least 24 distinct vocalizations as well as different visual displays. For instance, roosters emit one call to warn of aerial predators and another to warn of terrestrial predators. Devious roosters sometimes make food calls just to attract hens. As a counter-strategy, hens stop responding to males who call too often in the absence of food. Chickens experience a range of emotions. In a study of how mother hens respond to their chicks’ distress, hens were exposed to three conditions: a mild puff of air into their cage, observation of an air puff into their chicks’ cage, or the control, an air puff aimed outside the cages. The hens showed no significant response to air puffs in their own cage. When they observed their chicks receiving air puffs, however, their physiological and behavioral changes indicated emotional distress. In response to fear, chickens exhibit a variety of complex behaviors adapted to each circumstance, including capture and restraint. Linking emotion with time perception, hens were taught to discriminate three sounds which signaled, after a 15 second delay, either a food reward, a squirt from a water gun or nothing. In anticipation of a squirt, the birds exhibited more head movements and locomotion; waiting for food, the birds showed relaxed behaviors, such as preening and body scratching. In one study, hens were taught to peck a touch screen that delivered a food reward to the first peck after 6 minutes. The hens showed a pattern of increased pecking frequency around the 6-minute mark. In another study, hens were given a choice between either a 2-second delay followed by access to food for 3 seconds or a 6-second delay followed by access to food for 22 seconds. The hens opted for the longer delay and larger reward. Bowing to space, I’ll forego discussions of other for instances, including chickens’ understanding of numbers and very basic arithmetic, as well as their ability to understand that something still exists when out of sight. Suffice it to note that the researcher achieved her goals of gaining a better understanding of the minds of chickens and identifying compelling areas for future noninvasive research. One last thing. There’s a wealth of anecdotal evidence that chickens have individual personalities if you’d like to make their acquaintance. Thanks for stopping by.